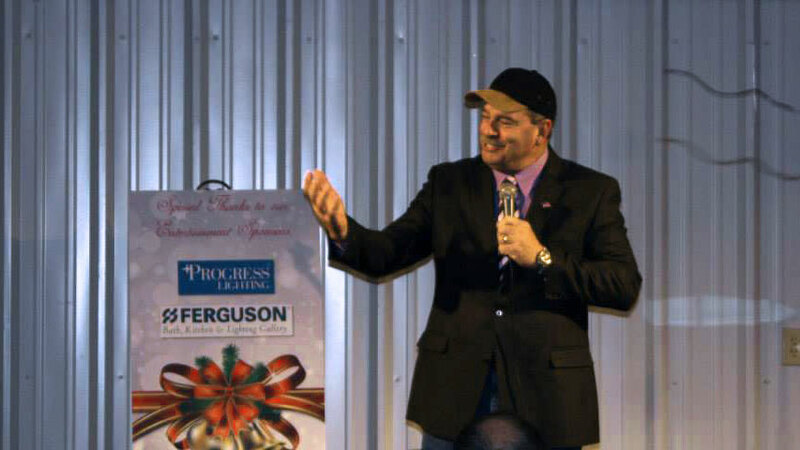 Nationally-touring agriculture speaker and comedian Jerry Carroll has recently performed in: Asheville, Battleboro, Clinton, Dublin, Elizabeth City, Greensboro, Hickory, Holly Springs, Monroe, Nashville, Raleigh, Rocky Mount, Roxboro, Smithfield, Wilmington, Wilson, NC and other cities. Jerry Carroll provided an atmosphere that we've never had previously at a Carolina Loggers Association event. He kept the crowd engaged during his show. I received numerous compliments on having him come join us so I know the crowd was pleased. Not only was he extremely funny, he tailored his show to relate to the loggers we had in the room. I talked with him prior to the event and he was very helpful and stayed in contact throughout the entire weekend." Jerry Carroll was an awesome performer. He engaged with the audience and kept everyone laughing. We all loved his country accent and especially loved the cowboy boots and hat. We highly recommend Jerry Carroll for any event!" Jerry Carroll was beyond amazing! He fit in so well with our venue, atmosphere and guests. The event was a HUGE success. People are already asking for him to return next year!" Jerry Carroll did a fantastic job and we probably had as good of a response from the employees as for any performer. He picked a few folks out of the crowd and had a lot of fun with them. He also led a little 'talent show' that we had added to the event. Thanks again"
Great show, everyone enjoyed Jerry Carroll. It is always a pleasure to see him. Thanks for working it out." Jerry Carroll was very entertaining. We had a great time!" Jerry Carroll was fabulous! Spoke with everyone, very prompt, and participated in our fundraisers we had. His material "hit home" for everyone in the room!" Thank you so much for everything. Jerry Carroll's comedy touched on everyone at some point during the show. The comments we received were great and we have not heard any negative comments. Everyone enjoyed the meet and greet after the show. You all were great to work with. We would have you back any time!" We were very pleased with Jerry Carroll! Everyone thoroughly enjoyed him. We did a survey following the convention and the response was overwhelming positive." Best comedian we have ever hired or will hire!!! This is the third time we have asked Jerry Carroll to entertain our guys, and he never fails to do just that... ENTERTAIN!! Quick and Dirty is he's AWESOME!! Always arrives early, show is personable, fits the audience no matter how diverse. Our entire audience loved him!" - Office Manager, Environmental Air Systems, Inc.
Jerry Carroll was the icing-on-the-cake to our annual conference and workshops. He related directly with parents, grandparents, farmers and executives - all on an insightful, entertaining level. One professor from the university finally had to take his glasses off because he kept wiping tears. Our event evaluations show the group enjoyed his program VERY much." Everyone loved Jerry Carroll! Some of our guests knew Jerry from other events they had attended and could not wait to hear him again. We will definitely invite him back!" Jerry Carroll was great. He exceeded our expectations. He was very funny and was able to keep the crowd laughing."